There is no doubt that both the 2016 and 2017 Chevrolet Camaro are high tech in every way. For example, the 2016 Camaro is a smaller car that weighs 390-pounds less than the previous model. It features an aerodynamic exterior and an interior that include rotating HVAC dials rather than a plethora of extra dash buttons so the driver can make quicker adjustments of the climate control. Moreover, the driver can select one of 24 colors to stream through tubes around the radio, door trim, and cup holders, which is a standard feature on the Camaro 2SS and available on the Camaro 2LT. The spectrum of color stream changes depending on the drive mode and offers a pulsing full-color light show when in Show Mode. The standard steering wheel is wrapped in leather and sports a flat-bottom to permit more knee room for the driver. An optional heated steering wheel is available. The LT trim includes 18-inch aluminum wheels, LED daytime running lamps, halogen projector-beam headlamps, and a unique grille exclusive to the LT. The RS Appearance Package exchanges the 18-inch wheels for 20-inch wheels, the standard headlamps for HID lamps with LED accents, and the standard grille for a chrome-accented grille with RS badging. The package also adds a decklid-mounted lip spoiler. The SS trim comes with 20-inch wheels, HID headlamps with LED accents, LED tail lamps, rear stanchion spoiler, functional air vents on the hood, wide grille with integrated brake cooling ducts, a 6.2-liter LT1 V8 engine that produces 455-horsepower and 455-lb-ft of torque, a 6-speed manual transmission with Active Rev Matching that anticipates downshifts through throttle blips for smoother shifting, and Magnetic Ride Control™, a magnetic suspension technology that monitors the road surface 1,000 times a second to adjust damper for optimum handling. A 2.0-liter turbocharged V8 engine powers the 2017 Camaro and generates 275-horsepower and 295-lb-ft of torque. The car races from 0 to 60 in 5.4-seconds with manual transmission and 5.5-seconds with automatic. Buyers also have the option of selecting the LT1 V8, which offers 455-horsepower and 455-lb-ft of torque, Direct Injection, Variable Valve Timing, and Active Fuel Management with automatic transmission. This engine races 0 to 60 in 4-seconds with automatic transmission and 4.3-seconds with manual. The 2017 model also sports a plethora of technology features including Apple CarPlay, a standard 7-inch or optional 8-inch diagonal touchscreen, Android Auto, voice-activated controls, and SiriusXM Satellite Radio, electronic park brake, keyless open and start, and power seats with available memory package. Optional equipment include wireless phone charging, Heads-Up Display, Bose® premium audio system, and built-in 4G LTE Wi-Fi that connects up to seven devices to the Internet. Finally, there is a myChevrolet Mobile App that allows you to command functions of the vehicle on a mobile device. It permits the user to start/stop the engine, lock/unlock the doors, download destinations to the available navigation system, view diagnostic information, and set parking reminders. 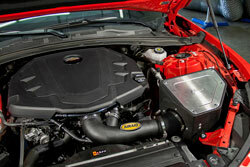 AIRAID is offering the AIRAID 251-332 air intake kit for the 2016 and 2017 Chevrolet Camaro powered by the 3.6-liter V6. The intake offers an estimated boost of 8-horsepower at 4950 rpm. The kit includes a washable and reusable AIRAID 701-461 universal air filter with a non-woven synthetic SYNTHAMAX® media that features an inner and an outer layer of wire mesh to ensure overall durability. The filter will not deform or collapse under high airflow. The media has two distinct layers of specially designed synthetic materials. The outer layer of synthetic needle felt polyester is designed for wet and dry filtration and captures and holds contaminants. The inner layer of wet-laid/chemical bonded rayon and polyester captures any remaining contaminants while maintaining high airflow and low restriction. 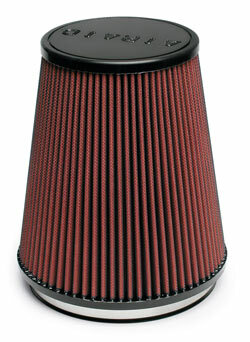 The air filter lasts between 30,000 to 50,000 miles under normal driving conditions. The air filter is contained within an air box that includes an aluminum lid that shields it from hot engine air. AIRAID also offers the 790-558 air filter cleaning kit that is specially formulated to cleanse and recharge the air filter so that it can be used over and over again for the life of the car. 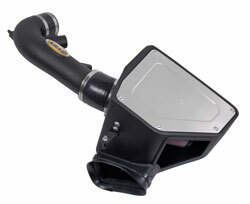 The air intake kit also includes a one-piece roto-molded air box that is specifically designed to enhance the shortcomings of the restrictive factory intake as well as a cross-linked constructed, high-density polyethylene intake tube that has been calibrated using computer-modeling to preserve proper air flow. Also included is a built-in velocity stack that also promotes airflow. The intake is engineered to increase airflow and maintain the proper air-to-fuel ratio. The intake is designed to bolt on using common hand tools and is covered by No Hassle Lifetime Warranty.